Dorset Coppice Group is pleased to announce that it will be hosting ‘Charfest 2019’! Charfest is a 4 day annual celebration of sustainably produced British charcoal. 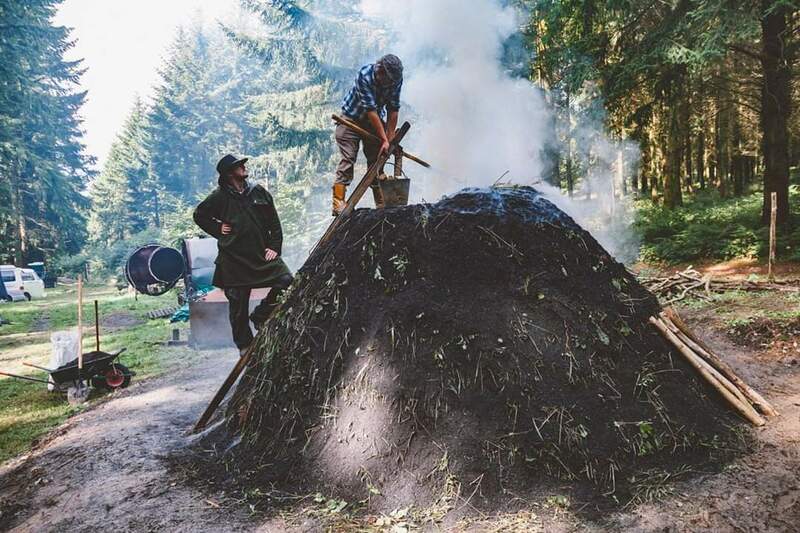 The centrepiece of the event is a traditional ‘earthburn’ and is one of only a handful of opportunities in the UK to experience this ancient form of charcoal production. Charfest is also unique in that it draws together a demonstration of three different forms of charcoal production: the earthburn, the ring kiln and the charcoal retort. The event will run for four days between the 9th and 12th August 2019 at Dorset Coppice Group’s ‘Living Classroom’ at Bonsley Wood. The earthburn will be built and lit on the Friday and should be ready for charcoal harvesting on the Monday. Throughout this time it needs to be watched and tended to constantly. On Saturday, we will also fill and light a ring kiln and charcoal retort. This will give you the opportunity to witness all three methods of charcoal production taking place simultaneously. We will be offering a number of camping tickets for people who wish to experience what it takes to be a ‘wood collier’. You will experience an earthburn from start to finish, including building, lighting, nurturing and finally harvesting. At the end of the four days, if all goes to plan(! ), you will be able to take home a bag of charcoal that you helped create. We will also be opening the site up on the Saturday to anyone who wishes to come along and learn more about the British charcoal industry. You won’t get the full charcoal burners’ experience, but you will get to see the action up close and meet the charcoal burners who still make their living from this ancient craft. Camping passes for attending the whole event will be £50 per tent and we will have 10 camping spaces available. This price includes your camping pitch, access to toilets and tea/coffee. You will need to supply your own camping equipment, food and drinking water. Day passes for the Saturday will be £2.50 per person, with access available to the site between 10am & 4pm. Discounted rates are available for Dorset Coppice Group members and details of this will be emailed to you in advance of tickets going on sale.